When it comes to keeping your home cool the insulation in your attic can have a huge impact on how cool your home remains during the hot and humid months. The attic tends to remain exceptionally hot when the temperatures increase outside your home. But, what many homeowners neglect is that this heat get redistributed to the rest of your home. You often will have to use more energy to keep your home at a comfortable temperature. One way you can say money on your utility and keep your home at a comfortable temperature is with the proper attic insulation. A radiant barrier is one of the most effective ways you can keep the extra heat out of your attic and hot of the rest of your home. What Is A Radiant Barrier? Radiant barrier is an optimal attic insulation option. Radiant barriers are radiant heat reflectors that helps reduce the amount of heat that is transferred from the roof to the attic. By reflecting the heat from the roof the attic remains cooler which limits the heat being redistributed to the rest of your home. Radiant barriers in your attic reflect heat from the sun away from your home. This results in a cooler attic and therefore a much cooler home. Your roof can easily be attracting a significant amount of heat to your home which easily gets seeped into the attic and then dispersed to the rest of the house. 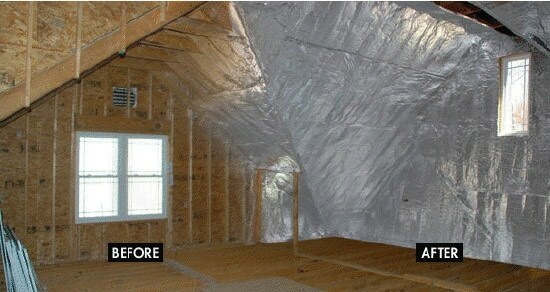 A radiant barrier significantly reduces the amount of heat that is leaked in from the roof. When the attic remains at a cooler temperature during on those hot and humid days the rest of your home stays cooler. Since a radiant barrier reduce the heat in the attic there is less heat to be dispersed throughout the rest of the home. This reduces your energy bills since you will not need to use as much energy to keep you home cool. The radiant barrier also helps keep the cool air from the air condition vents or ducts circulating inside the home. With a radiant barrier you do not have to be cautious of hazard materials that can sometimes be found in other forms of insulation. It is a durable, yet lightweight reflective foil material that is easy to instal and safer for you and your family. Installing a radiant barrier can be a cost effective and simple process when done by a professional attic insulator. Installing a radiant barrier yourself is not highly recommended. You want to ensure that the barrier is installed properly so you do lot lose crucial cool air or unknowing let in the warm solar energy from the roof. Attic Pro is a professional and trusted attic insulation company that serves the Houston area. They can provide you with a quick and professional radiant barrier insulation service. Give them a call at 884-892-8842. Attic Insulation & Clean-up Services Houston, TX ©2016 All Rights Reserved.